Here’s part 3 of my 4-part series on the Bluefield Blue Jays (it may end up being a 5-part series, but I’ll try to get the hitters done in just one). It was an interesting mix of pitchers in the bullpen for the Jays and while you don’t usually consider relievers prospects until they get much higher in a system, there are a couple of arms that are worth noting as they rise through the Jays’ organization. The closer for Bluefield Blue Jays was 2013 37th-round draft pick Brett Barber, a 22 year old from Ohio University. Barber had a very strong first professional season, not missing a beat from his closer’s role in college with 7 saves (and finishing 15 games) in 19 appearances and 21 1/3 innings. He posted a 3.80 ERA and 1.03 WHIP with only 5 walks and 23 strikeouts. Barber is a born reliever with a max-effort delivery and kind of a short-armed delivery but he gets the ball into the high-80s consistently (touching 90 mph) and could get swings and misses with his curve. Barber will move quickly through the organization (provided he can get batters out) because of his “throw strikes” approach. I see Barber coming out of the bullpen in Lansing in 2014. 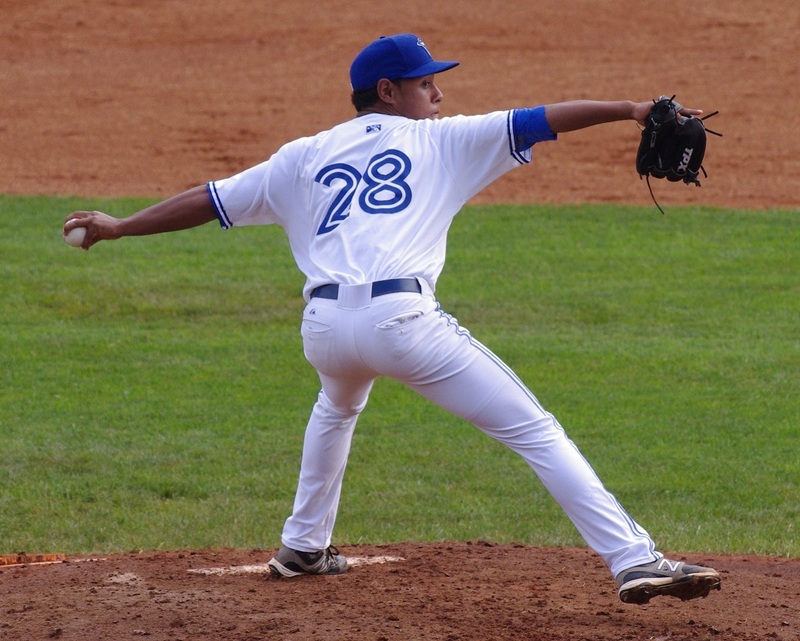 Francisco Gracesqui was a non-drafted free agent signed in August of 2011 and the 21-year-old lefty from the Bronx, NY had a strong second professional season. He threw 22 1/3 innings and posted a 2.82 ERA and 1.52 WHIP with 12 walks and 16 strikeouts this season after a similar season in 2012 in the GCL. In my notes from Bluefield, I wrote that Gracesqui throws in the high-80s (87-89 mph) with a good changeup that sat around 80-81. I observed that he got a couple of consecutive swings and misses on the changeup in one game I saw. I could see Gracesqui in Vancouver or Lansing next year. I never got a chance to see Yeyfry Del Rosario, the 19-year-old Dominican, in person but he had a strong season coming out of the bullpen for the Blue Jays. He threw 28 1/3 innings with a 2.54 ERA and 1.38 WHIP to go with 15 walks and 33 strikeouts. The strikeouts are clearly fantastic but his walk rate jumped this season from 6.5% last year in the GCL to 12.1% in Bluefield. I could see Del Rosario going a few different ways in 2014 whether it’s back to Bluefield, up to Vancouver or up to Lansing. If the Blue Jays have him tagged as a power bullpen arm, he could jump to Lansing. If the Jays want to stretch him out as a starter, he could return to Bluefield. After a big step forward in a repeat of the GCL in 2012, 20-year-old righty Adaric Kelly showed some regression when moving up a level in 2013 with the Bluefield Blue Jays. Kelly struggled mostly with his control, walking 14 in 23 1/3 innings but also struck out 22. Aside from that, he had pretty good numbers with a 2.70 ERA (but a 4.06 FIP) and a 1.54 WHIP and, with Barber, Gracesqui and Del Rosario, was one of a core group of relievers that helped Bluefield make the playoffs. Kelly throws a fastball that sits around 88 or 89 mph and a very impressive changeup around 79 or 80 mph. I saw him break two bats in a row with the changeup with shows his ability to disrupt hitters’ timing with it. I think we’ll see him in Vancouver in 2014. Joe Lovecchio‘s season started well after signing as a non-drafted free agent, pitching a couple of innings with the GCL Jays before getting the call up to Bluefield. His numbers in Bluefield weren’t great: a 6.30 ERA and 1.65 ERA over 23 2/3 innings walking 9 and striking out 20. When I saw him, it was a tale of two Joes. He had one outing in which he got hit hard and another one in which he pitched well. The 23-year-old will likely end up in Vancouver next year to play against competition more at his age level. Righty Alvido Jimenez was one of the best pitchers for the Bluefield club, throwing multiple innings of relief when called upon. He threw 21 innings for the Blue Jays (in addition to another 9 2/3 with Vancouver) this season after being selected in the minor league portion of the Rule 5 draft and posting a 1.29 ERA and 0.87 WHIP with just 7 walks and 27 strikeouts. Jimenez may end up in Lansing and despite being just 21 years old, he now has 4 years of minor league experience to bring with him. Phil Kish was one of the older players on the club, spending most of it as a 23 year old and turning 24 on August 30. He also pitched well after signing as an undrafted free agent with a 1.96 ERA and 1.09 WHIP over 18 1/3 innings with 6 walks and 16 strikeouts. Very solid numbers for a guy who comes out of a 4-year college program. Kish should be in Vancouver next year. Justin D’Alessandro got a taste of Vancouver before being demoted to Bluefield. The 23-year-old righty struggled with his control a great deal at both levels and he may be running out of chances to show that he belongs in the Jays organization. A 2012 non-drafted free agent, D’Alessandro posted a 7.94 ERA in Bluefield with a 2.38 WHIP with 8 walks and 11 strikeouts in 11 1/3 innings. There are positives: The 11 Ks show that he can get (Rookie League) batters out and his BABIP was a sky-high .421 to give him a better 5.65 WHIP. I’m not sure where he ends up next year. I actually didn’t pay much attention when I saw him pitch (aside from noting the lack of control) and he’s probably one of those guys that can get lost in a bullpen. Hopefully he can turn things around next year. Coming up next: The hitters!